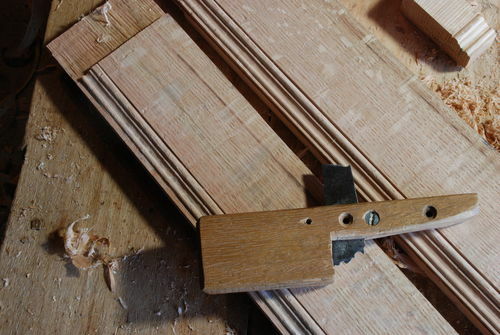 This is a spokeshave-like tool used to bead, reed, or flute straight or curved surfaces. It has a thumb screw mechanism used to secure flat cutters, which are identical to the kind you’d make for a scratch stock. Inspired by the windsor model of 1885 with its own adaptations, I show the step by step of its construction. A very nice looking tool, and an excellent build video. I salute you for the make of that scratch stock. What stock did you form the cutters from, looked a lot thicker than what I am used to. I’ve always gone with a lot less work to make mine, just form an edge on an old saw plate, drop it in a saw kerf, run a screw into it to clamp it. Sometimes you put on an edge guide, sometimes it will only cut to a certain depth based on the way you form the wood, limited by the amount of edge exposed. Downside is my type are for just a small amount of work, and that is mostly because they are frail, and soon to fail. Upside is they are stuff you have laying around, and CHEEEEEP to make in just a few minutes. Like this, with a U decide what profile you want to cut. Very useful and very nicely designed. Enjoy using it. Very practical and simple tool. Well done.